The 2017 Nissan Titan XD gas king cab is 230.5 inches long. 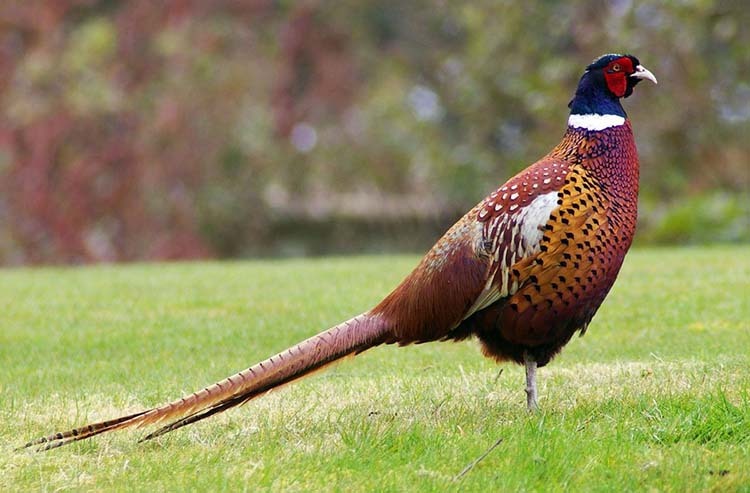 A ring-necked pheasant, on average, is about 2.5 feet. The 2017 Nissan Titan XD gas weighs 6,207 lbs unloaded. A ring-necked pheasant, on average, weighs about 2.5 lbs. 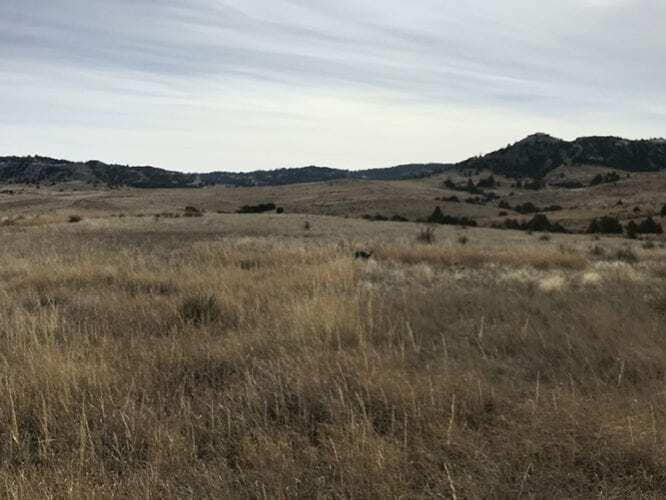 In terms of size and scale, the Titan XD and a ring-necked pheasant aren’t even close to comparable, yet using one to hunt the other brings out some interesting insights. Sure, any truck can be a hunting pickup, but not every pickup can be a good hunting pickup. 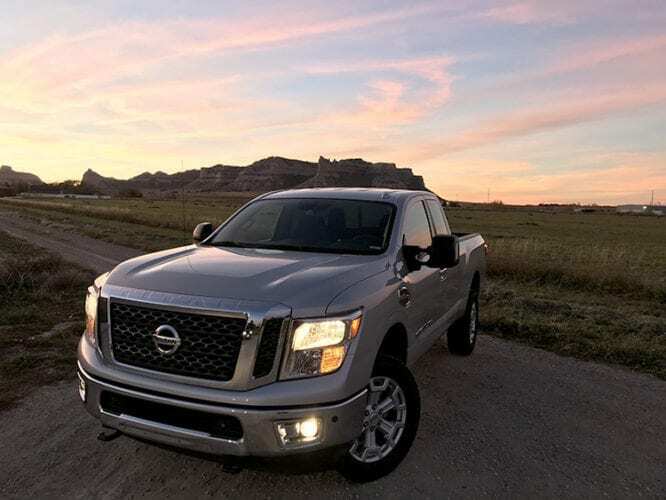 Introduced in 2015, the Nissan Titan XD is going into its second model year while its half-ton brethren hit the market last year. Nissan has dramatically increased its truck lineup with the XD and non-XD trucks offering trucks in all cab and bed configurations and a Cummins diesel in the XD. The XD trucks are meant to be a heavy-duty half-ton or tweener truck. 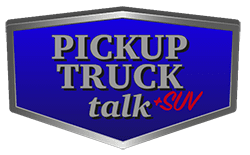 Basically, you get the ride quality of a half-ton truck and not the harsh ride of a heavy-duty mixed with an overbuilt half-ton for less money than a heavy-duty truck. Well that’s the thinking anyway. The reality is the marketplace has caught up quickly to the Nissan Titan XD. Ford has a new range of Super Duty trucks that ride nothing like their predecessors. Chevy has been putting cash of the hood seemingly without end and Ram’s and Ford’s new luxury trim levels are so good, consumers are spending the extra money on them. 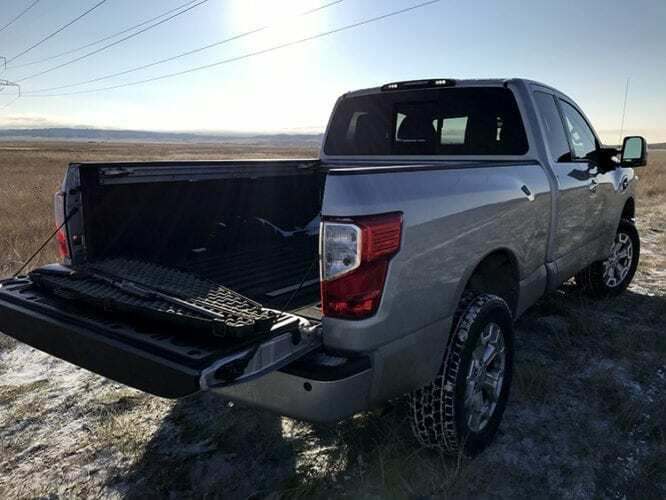 The rear tailgate is the only way of identifying which trim level is which on the Nissan Titan XD. 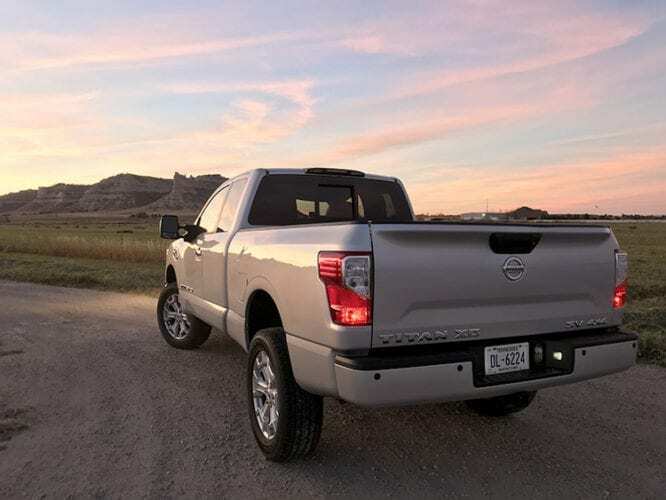 Nissan has a Platinum Reserve luxury trim, however, without a side badge declaring how much the owner spent like the King Ranch, Denali or Laramie Longhorn, consumers have gone elsewhere. 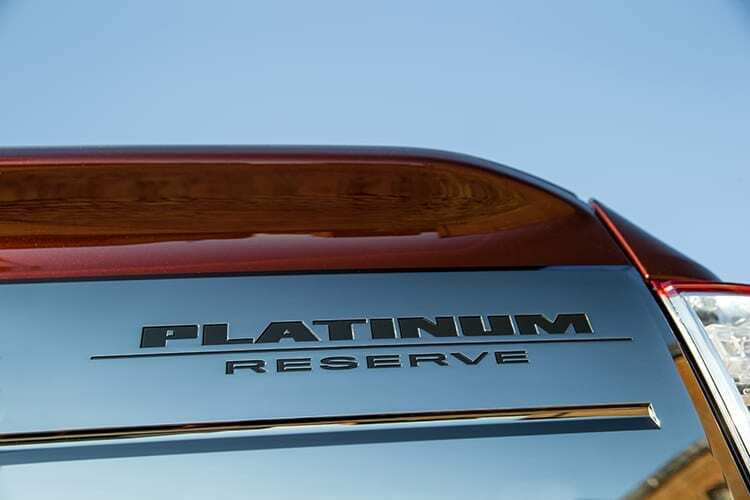 Now, there is nothing wrong with the Platinum Reserve and it is a really nice trim level. However, with the competition fighting it out over who has the more pretty headliners (yeah, we are at level of competition), Nissan has fallen behind in that category. The other point of the tweener truck was about towing capacity. Nissan marketed this truck to fill the gap between half-tons and heavy-duty truck consumers. They declared hundreds of thousands of consumers were switching between the two each year because they couldn’t find the truck to fit their needs. So, Nissan built a heavy-duty half-ton to fill this gap. 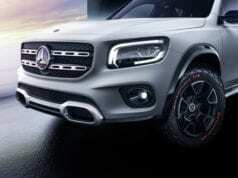 I’ve argued for this truck for sometime. 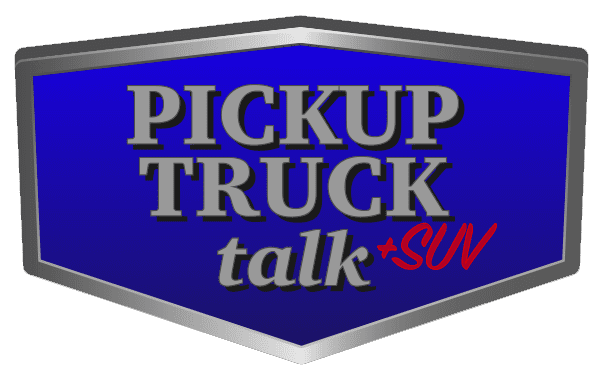 The truth is heavy-duty truck’s towing capacities have skyrocketed (30k lbs is now about average for a 1-ton) and while half-ton trucks have improved, they do leave a gap. 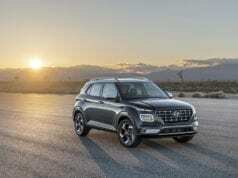 Now, Ford and others will tell you they have the same towing capacity Nissan does with their half-tons. For the record, the 2017 Nissan Titan XD with the 5.6L gas in a 4×4 king cab configuration we drove has a maximum towing capacity of 11,060 lbs. Ford says it has a half-ton that can tow 12,200 lbs properly equipped with the 3.5L V6 EcoBoost engine in a 2wd regular cab, long bed with 3.55 rear axle gear ratios. If that sounds incredible, it likely is. The truth is while the Ford truck can likely pull that much weight, you need to get your head examined if you plan to do the same. For the Nissan Titan XD, I’ve towed upwards of 10,000 lbs and it tows it very, very comfortably. Now, I’ve towed a 16′ fiberglass boat with a F-150 Super Cab and the 3.5L V6. 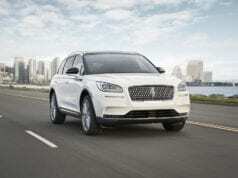 Unfortunately, I can’t say the same about the Ford as I do the Nissan. In reality, there is thing called towing confidence. Just because the sticker on the door says you can do it, doesn’t mean you can do it comfortably and that is where the Nissan Titan XD excels. Back to hunting and real life. Let’s say you pull your bumper-pull camper up to go hunting for the weekend and plan to use your truck to scout the fields. Which truck would you take – a half-ton, a 3/4-ton truck or a tweener truck like the Titan? You could pull it with your half-ton and be careful what you pack since payload concerns would dog you the entire trip – adding more towing reduces payload. Gross combined vehicle ratings are limits to how much you can carry total by the way. You could pull it with a 3/4-ton truck and overkill the whole operation. Plus, you would have to deal with the hellish ride quality on dirt roads and over corn fields. If you have ever taken a heavy-duty truck across rutted corn rows, you immediately get the idea and are likely grabbing your lower back as I type this. Finally, you could take the Nissan Titan XD. You would pull your camper easily AND you could drive around with it and not have to see a chiropractor when you are done. Now, the Titan isn’t without its faults. First, the XD lineup of trucks isn’t required to have EPA ratings for fuel economy. This is a good thing – for Nissan. I’ve driven a variety of these trucks and never got better than 17 MPG. Second, the ride height on the XD is absurd. I’m 5’7″ on a good day and the bottom of the cabin hits me right around my hips. Hopping in and out like Bo Duke isn’t my idea of a great pickup and side rails were sorely missed on my press loan. However, that doesn’t solve all the problems. When did truck beds get so tall? Loading up my shotgun at the nearly chest level of the bed is somewhat handy, but I can’t imagine trying to load a buck into the back of this truck. Sure, most guys aren’t “vertically challenged” like I am, but still. I challenge the majority of guys to try to reach the middle of this truck bed. It is impossible to do so. That means, each time, you have to climb over the tailgate to get items from the middle of the bed. Not great. Now, with that said, the pro to having a tall truck was I didn’t really have any concerns about where I was going nor where I wanted to go. This “warning” gave me a good chuckle. It never did turn off that morning. Oh and I was sweating. The morning of the hunt brought the first snow storm to my area and this meant frozen roads. Passing by three different accidents, I never was really concerned about the Titan. Heck, I nearly forgot to put it into four-wheel drive HI before leaving and only remembered the problem with truck physics and an empty 6.5″ bed. Those things don’t go well together especially on ice. In fact, the drive was fantastic with the truck doing everything I asked. It even provided some FUN as I “drifted” through a 4-way stop as I made a left-hand turn. Good times! 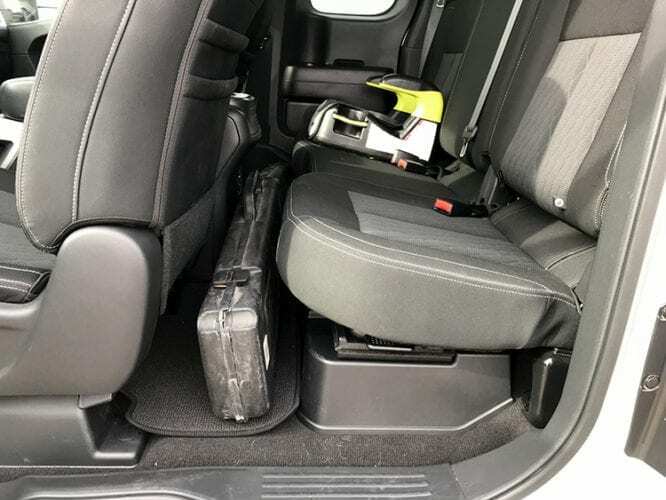 If you are curious about how much room there is in a King Cab (extended cab), let’s just say there isn’t much. Plus, the heated seat warmers and heater did a great job of warming up my hands so I could turn the tiny radio dials. 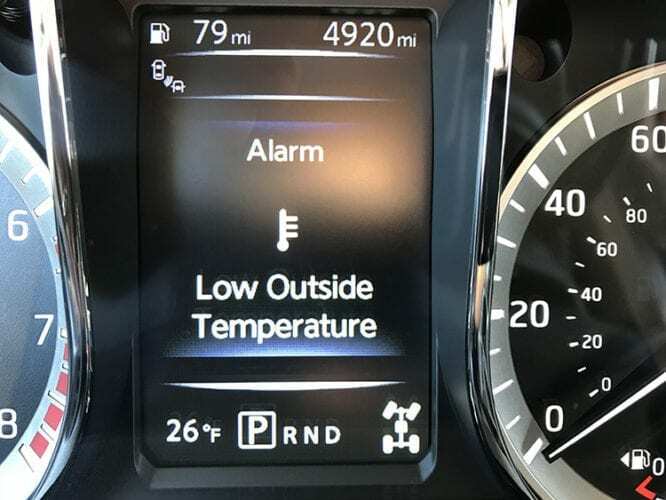 Seriously Nissan. Make those knobs larger. They are nearly impossible to use with gloves on. While I ultimately came up empty handed on the hunt, the truck delivered and it took me safely and confidently from home to the field. Heck, it even helped me find it in the middle of the field. Turns out the gleam I was seeing wasn’t a group of pheasants and instead was the truck’s chrome grill. Pretty sure I’m glad I didn’t fire off a shot. I’d hate to have to explain that one.